Besides choosing good passwords, you can do a number of things to make your Mac even more secure. You can choose safer security settings, use Software Update, secure your e-mail, watch out for phishing, and lock up your computer when you’re away from it. These simple steps go a long way to making your Mac more secure. 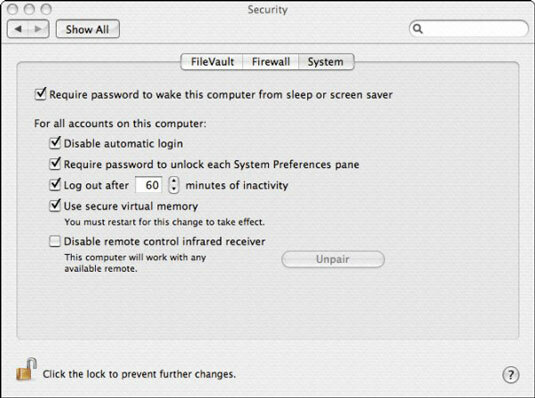 Require Password to Wake This Computer from Sleep or Screen Saver: Select this check box to protect your unattended Mac. Disable Automatic Login: Select this check box if you care about security. If you don’t select it, the computer will automatically log on to the primary account every time you restart it. Require Password to Unlock Each System Preferences Pane: If many people share your computer and you want to retain strict control, select this check box. Use Secure Virtual Memory: If you plan to use FileVault, select this check box. Your Mac sometimes writes temporary information to disk to free more of its main memory. Because this temporary information can contain sensitive information, you want it encrypted, too. Disable Remote Control Infrared Receiver: Someone with a remote could get your computer to display images you’d rather not share. If this prospect frightens you, select this check box. Keep up to date with Software Update. Apple works hard to correct problems and periodically distributes corrections via the Internet. Out of the box, your Mac checks for available updates weekly. To check now, select Software Update from the Apple menu. You can change how often automatic checking occurs by selecting System Preferences from the Apple menu and clicking the Software Update icon. This is also the place to check which updates have already been installed. Secure your e-mail. If you use programs like Pretty Good Privacy (PGP, from www.pgp.com), Gnu Privacy Guard (GnuPG from macgpg.sourceforge.net), or Hushmail.com to encrypt and electronically sign e-mail, you’ll be glad to know that Mac versions of these programs are available. Watch out for phishing. You’ve probably encountered phishing, e-mail messages that look like legitimate requests from upstanding organizations. The message includes a link that takes you to what seems like the Web site of that organization, where you’re asked to enter your account number, password, and any other personal info they think you can be conned into surrendering. If you have any doubt that the message is phony, do not click the link in the e-mail. Go to the organization’s Web site by typing their URL in you browser’s address field and navigate to your account. Lock it up. Computer security is almost meaningless without physical security. If a sophisticated attacker gets to spend quality time alone with your Mac, all the fancy technology may be of no avail. Laptops are easier to steal than desktop machines, but they are also easier to lock in a desk or safe. All Mac laptops have a hole in the side designed to accept a mechanical locking device, such as those made by Kensington.com. Record your computer’s serial number. Select About This Mac from the Apple menu. The serial number is listed in the hardware Overview section. It is also a good idea to mark your computer with your name and address. You can place an address label inside your laptop’s battery compartment. A colored sticker on the outside of your laptop makes it harder for a thief at the airport to hide in a crowd.